August 9th is the date and Lerkendal Station in Trondheim, Norway the venue set for the next edition of the UEFA Super Cup, a match contested by the reigning champions of the two main European Club competitions, the Europe League and the Champions League, so therefore this year the teams involved are Sevilla and Real Madrid. This is the third consecutive year of an all-Spanish UEFA Super Cup. The overall outcome has been 9-7 in favor of the UEFA Champions League holders. This is the fourth time at a Super Cup for Sevilla Football Club, last year this team disputed the UEFA Super Cup and lost against Barcelona. Real Madrid and Sevilla faced off in 2014 and in that occasion Real Madrid took the win with a score 2-0, which makes this a very personal challenge for Sevilla that should be more motivated than ever in winning this title. Real Madrid is expected to play without several of its main stars as Cristiano Ronaldo is recovering from a knee injury, goalkeeper Keylor Navas is still in recovery of a foot surgery, center-back Pepe and Gareth Bale are still on vacation break and are not expected back for the Super Cup, Tony Kroos and striker Karim Benzema are also doubts at this point; this may not be great news for soccer fans, but it provides a great opportunity for new figures to emerge. When it comes to Sevilla’s line up, striker Fernando Llorente just left the team and signed a new contract with Swansea, that’s as much as we know for now, and it will be a matter of seeing which Real Madrid team they will be facing. Sevilla is also scheduled to face Barcelona on August 14th for the Spain Super Cup. Whatever happens on August 9th one thing is for sure, Spain will remain the most laureate country of the UEFA Super Cup currently holding 12 titles and 22 appearances in total. 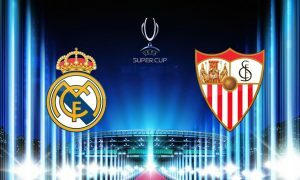 Odds to bet the UEFA Super Cup 2016 has Real Madrid as the favorite to win with a moneyline of -115 a point spread of -1 and a total of 3, I like the underdog here and will bet on Sevilla at +1 to win the Super Cup at AceSportsbook.com. The best place to get your bets in soccer matches around the world is Ace Sportsbook, get your account set up today, is free and simple, the customer service is amazing, I enjoy the LIVE betting more than anything else, give it a try and add excitement to all the soccer matches you like.